The causes and effects of spiralling interest rates in 1920s Germany, when money became so devalued it was burnt as fuel. 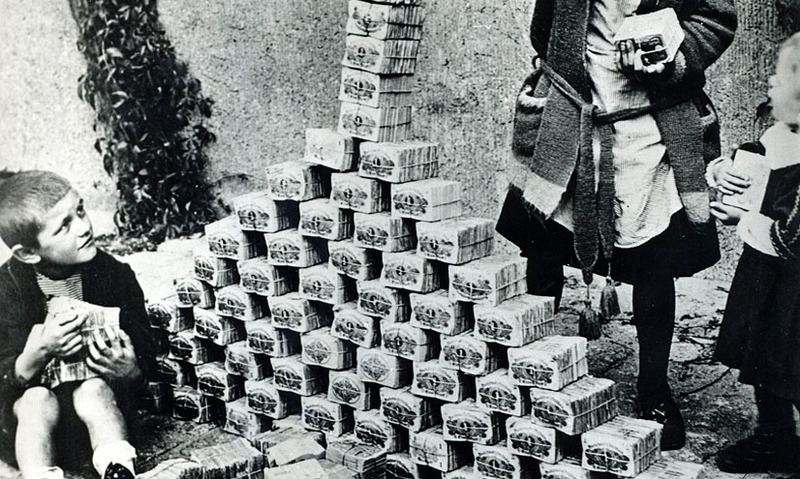 In the 1920s, a financial crisis in Germany made its money so worthless that it was burned as fuel. World War One resulted in death and destruction, on an unprecedented scale. When the war ended, Germany was made to pay reparations to compensate the other countries involved – over 130 billion gold marks in total. The burden of these payments was too much, so the German government simply began printing more money. But as new notes were printed, each note in circulation became less and less valuable. Because money was worth less, the price of goods had to increase. Inflation is a normal occurrence in most countries, and reflects the changing cost of living. Inflation usually occurs at a few percent a year. So, in modern terms, a loaf of bread which might cost the equivalent of a dollar one year, would cost maybe a dollar and two cents the next. 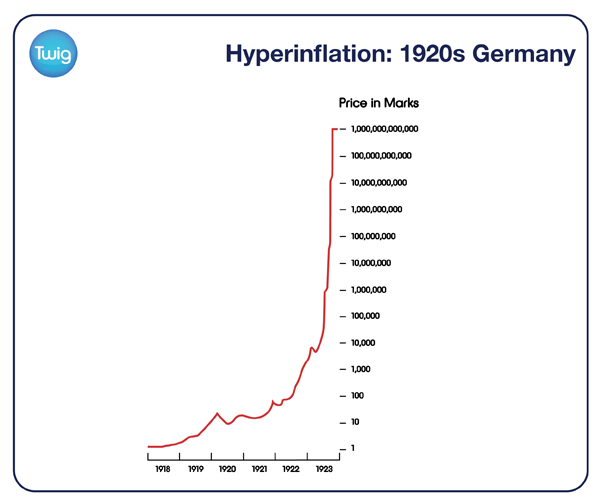 Back in 1913, German inflation was around 2% per year. But by 1923, inflation reached a staggering 900% per month. At this rate, each month, costs are multiplied by 10. Inflation this high is known as hyperinflation. Whereas in 1913, a pair of shoes cost around 12 marks, by the summer of 1923, shoes were sold for 32 billion marks. Eventually, prices were increasing by 41% each day. At the height of hyperinflation, one dollar was worth a trillion marks. Wages were so huge that they had to be collected in laundry baskets. But despite being millionaires, families struggled to buy food, and people burned piles of money because it was cheaper than firewood. Eventually, in November 1923, the old mark ceased to exist, and a new currency was adopted in its place.